A group taken at the formal opening of Quorn Warship Week. Included in the picture: Sir Lindsay Everard, M.P., Lieut-Commander Ellingworth R.N., Lt.-Col. W.S.N. Toller, D.S.O., Mr. C. Roberts, Mr. Sydney Wright, Mr. F.W. 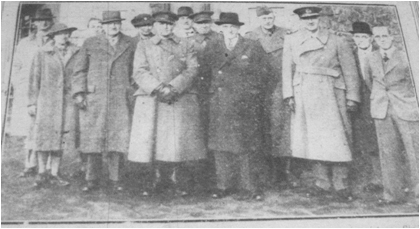 Bailey, Mr. W. Jacques, Mr. D. Stirling, Mrs. Roberts, Mrs Woodcock etc.